This week we are featuring several prominent workouts from our Nations CrossFit Law Enforcement Affiliates. This are challenging workouts created by active duty Law Enforcement Officers who are also CrossFit Level I Coaches at their CrossFit Law Enforcement Affiliate gym. These are gonna’ be good ones! Note: Weight for men is up to 135lb. and women 95lb. The weight will be starting from the ground on, and technique for Backsquat barbell placement from the ground will be taught. 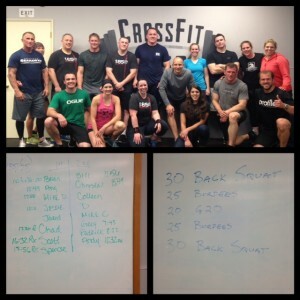 This workout comes from CrossFit 1850, which is a CrossFit Law Enforcement Affiliate at Oregon City Police Department, Oregon. On Wednesday, April 23, Greg Amundson visited the brave men and women of CrossFit 1850 and participated in this awesome workout. Special thanks to Jim and Patrick for their hospitality and for setting such a great example to the CrossFit Law Enforcement community. Please join us for the CrossFit Amundson Yoga and Mobility Class tonight from 6:00 to 7:00 PM, and Krav Maga from 7:15 to 8:00 PM.